In 6 months, Joe lost 20lbs and 6% body fat. 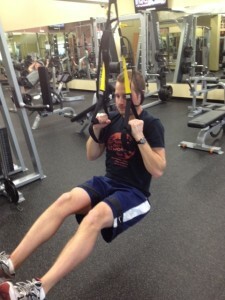 When Joe started personal training, he could not do any pull ups unassisted. Now, he can do many regular and TRX pull ups. I joined Anytime Fitness in June of 2011 after many failed attempts with other local gyms. Even though I was in decent physical health, I didn’t feel like I was in the best health mentally, and I didn’t feel as though the other gyms really stressed this. I have always been a long distance runner, and I certainly knew how to do cardio workouts, but what I was missing was the mindset to want to do these, as well as the knowledge on what exercises are the best to improve strength. I didn’t feel as if these other gyms I went to cared about my personal goals or my want to improve. Right away I talked with Jessica Helmlinger, and she agreed to be my personal trainer to help me achieve these goals I sought. With the personal attention and the workouts that Jessica came up with me, I dropped 20 pounds of fat, 4% body fat, and was able to recover from a pretty nasty case of plantar fasciitis, all in 6 months. Most importantly, I feel like I actually want to work out, instead of seeing it as a chore. Combining this guidance and this newfound ambition, I don’t see anywhere to go but up (but not in body fat!). It’s amazing to see what good physical health can do to the mind, whether it’s in the foods that I now eat (I recently gave up eating out for Lent), to generally being in a better mood, to sleeping better at night, it seems as if life has just gotten much more fulfilling. One of my life goals is to be able to run a marathon. For now however, I’m going to have to start small, so I’m looking at doing 5k’s and a half marathon later this year. All of this would not have been possible without the guidance of Jessica and the great environment I got at Anytime Fitness. Previous Post:Success Story- Erica K.